Those of you on Facebook may be aware that we moved back in to our Greenlake house this weekend. We’re still unpacking a lot of boxes and getting rid of a lot of things, which is wonderful. We’ll be throwing a house re-warming party sometime in the near future to celebrate. 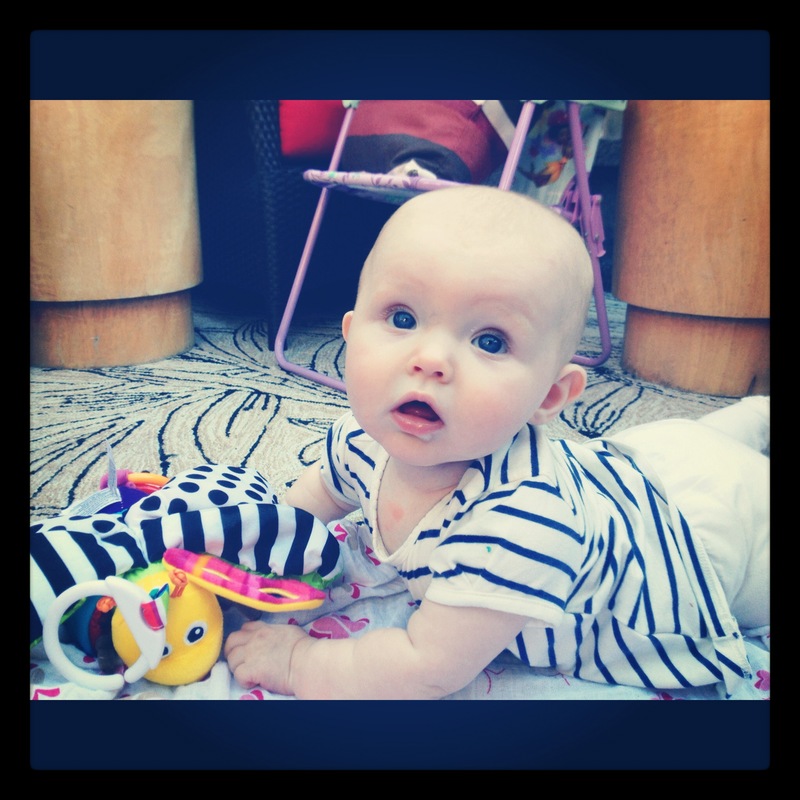 Just a quick post today – Ellie is obsessed with putting her feet in her mouth! Socks or no socks, she has no preference. We caught some of the action on video and we got a couple of pics. Yay! Ellie slept through the night last night! She went from 8:30-7 without waking up or needing to eat. She had gone the prior three nights without eating, but this was the first time we didn’t have to get up at all. For other parents out there, I really want to share our methodology. A lot of people told us if we wanted her to sleep through the night we had to just let her cry it out, but I had a seriously difficult time accepting that. After doing some research, we found an alternative called the No-Cry Sleep Solution . We thought it was pretty hokey, but we did it for three nights anyway and apparently it works! Here is a link to the information: http://www.pantley.com/elizabeth/books/0071381392.php?nid=172&isbn=0071381392. All we did was read this blurb, rather than buying the book. My first week back at work was good and we had such an awesome weekend, first visiting with Grandma and Grandpa Doman at Lake Tapps and then going down to Hood Canal. We went to the Tahuya parade, Brian went crabbing and we visited with family a ton. Here are some fun pics of our visit. This week has been interesting and exciting, partly due to the holiday smack dab in the middle of the week, but mostly because of all the fun stuff going on. I went back to work this week, which was better than I expected. The build up was worse than the actuality. If I would have had to go five days straight though, I think it would have been incredibly difficult. It was great having the holiday in the middle of the week and it’s wonderful that my boss agreed to allow me to work from home two days a week! I honestly think that’s going to make such a difference and help me ease back into the swing of things. We’ve also been working on helping Ellie sleep through the night, trying something called the No Cry Sleep Solution. We’ll let you know in a week or so if it’s working or not. Ellie’s nanny, Diana, took Ellie to the park today for a play date with a friend of hers that nanny’s a 7 month old boy named Hank. We love the interaction with other babes! Lastly, here’s a video of Ellie doing tummy time on her new mat. She’s trying really hard to lift up her bum and push up on her arms. Once she gets the hang of it, we have a feeling we’re in trouble; she already wants to be on the go all the time!